For ecommerce business owners, those two words rank higher than the boogeyman and that dream where you’re naked in 4th period English in terms of things that keep you up at night. Unfortunately, unlike those other two nightmares, cart abandonment is all too real - and all too prevalent. According to research conducted by the Baymard Institute, the overall cart abandonment rate for online stores is a whopping 69.23%. In other words, for every ten online shoppers that load up their virtual shopping cart, less than three of them actually end up going through with their purchase. When a potential customer abandons their cart - regardless of their reason for doing so - your main focus is going to be on getting them back on track toward making a purchase. After all, they certainly have some level of interest in your products, otherwise they wouldn’t have filled their cart on your site in the first place. One of the best ways to get your cart abandoners back on track is by reaching out to them via email - which is exactly what we’ll be discussing in this article. Before we dive into how to craft the perfect abandoned cart email, let’s quickly go over why email is such an effective tool for getting your potential customers back on track. Needless to say, such results are astounding when compared to the typical open, click-through, and conversion rates of all marketing-related emails. Of course, these results aren’t necessarily guaranteed. As with all marketing initiatives, your cart abandonment emails need to be attractive and provide value to your customers’ experiences with your brand in order to be effective. “Abandoned carts are a great business opportunity. With that in mind, let’s take a look at how to create a cart abandonment that not only gets your cart abandoners back on track toward making a purchase, but also gets them to stick around well into the future. While there are a number of “nice to have” features that can really make your cart abandonment emails stand out, let’s go over the ones that can absolutely make or break the success of these emails in the first place. Obviously, the very first part of your cart abandonment email (or any email, for that matter) that your recipients will see is the subject line. So, you absolutely need to use it to grab their attention - otherwise they’ll never end up seeing the rest of the email you worked so hard to create. FIrst things first, be sure to include the customer’s name in your subject line. As Klaviyo reports, companies that included a customer’s first name in the subject line of their cart abandonment emails saw an open rate of 41.67% - almost 1% higher than those with subject lines that didn’t include a name. 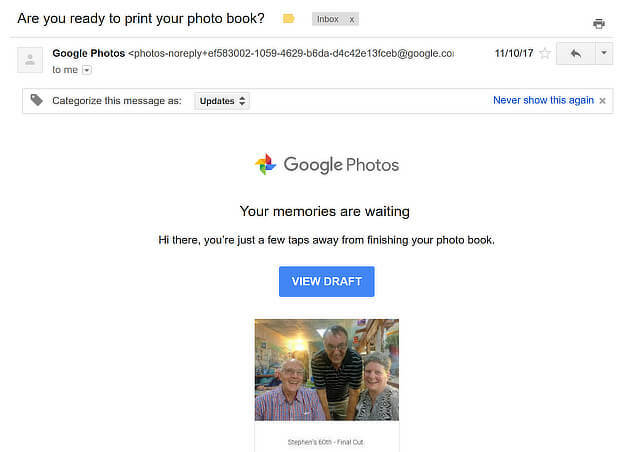 If you don’t have a customer’s name on file (for example, if they provided their email address and nothing more), you might choose to use a more personable greeting like “Hey there,” or something along those lines. Another point worth noting regarding being personal and personable is that you might also want to send the email from an account with an actual name attached to it. For example, rather than “info@xyzcompany.com,” use “john@xyzcompany.com.” Or, as in the above example, use “The Team at XYZ” or something similar. Other than a personalized/personable greeting, there are a few other tactics you could implement when creating a subject line for your cart abandonment emails. Be cautious when using humor, though; if it doesn’t fit your brand, or your target customers don’t exactly expect you to be humorous (or if you use “humor” as an excuse to be downright rude), it will likely do more harm than good. You also want to make the value of your email clear right from the get-go; if you’re including an incentive, be sure to at least allude to it within your subject line. Finally, on a more logistical topic, take care to ensure your subject line is the proper length. Make it too long, and your recipients won’t be able to see the whole message - and won’t care; make it too short, and you won’t be able to properly communicate the value of the message within the email. Call-to-action? Multiple checks (more on this later). This example is much more straight and to the point - which completely matches the typical sleek feel of J. Crew in general. Also worth noting is the quick-hitting compliment included in this email; while perhaps a bit transparent (as in, the message “Nice picks, btw” likely appears no matter what items are in the person’s cart), it’s still a bit of positive reinforcement to get the customer back in the mood to make a purchase. 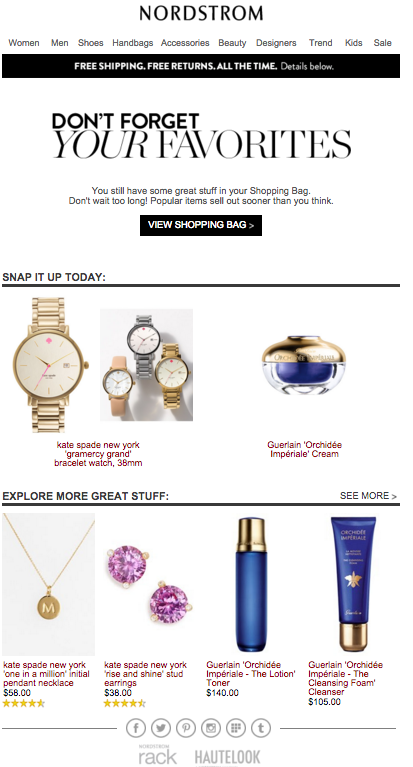 Imagery is also incredibly important within cart abandonment emails, as well. 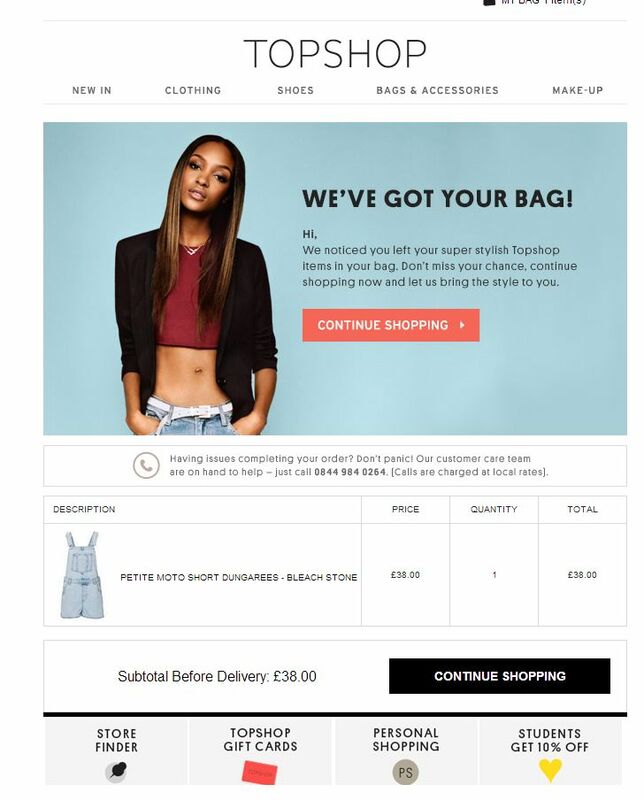 In the following example, clothing company TopShop includes both an image of the product within the consumer’s shopping cart, as well as a branded image of a model wearing other TopShop clothing. As far as the “feel” of the body of your cart abandonment emails go, again the most important thing is to make sure it all matches your brand’s messaging overall. That said, there are a few ways you can go about crafting the body of your emails. For those of you familiar with Poo-Pourri’s brand, no explanation is necessary here; for the uninitiated, no explanation could possibly do justice to this incredible email copy. Rather than relying on the typical “Oops, you forgot to check out!” abandoned cart email, Glossier brings its customers into the fold by providing a two-sentence primer on marketing automation - while also working to get cart abandoners back on-site. Of course, you don’t need to use humor within your abandoned cart emails - especially if doing so doesn’t make sense for your brand. 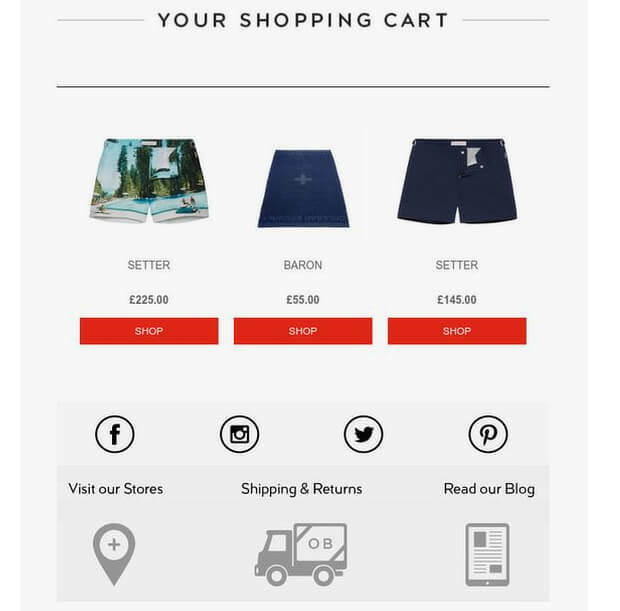 No matter how you approach the creation of your cart abandonment emails, you ultimately want to ensure that they serve to help your would-be customers in some way. Take a look back at each of the examples we’ve used so far; whether serious, comical, or tongue-in-cheek cheesy, they all eventually get down to the business of helping potential customers get on track toward converting. As we’ve discussed a few times throughout this article, personalization is key when it comes to re-engaging cart abandoners. But “personalization” is more than just including their name in the subject line and salutation within the email (though, again, doing so is important). What’s more important, though, is that you use your cart abandonment emails to further enhance the individual consumer’s experience with your brand. You can do so by digging deeper into the individual’s history with your company, as well as what led to them abandoning their cart. While this may at first seem like it wouldn’t exactly work all that often (“Why would the customer want to spend more money if they weren’t willing to spend a smaller amount?”), the case may very well be that their initial choice of product(s) simply didn’t provide the value they were looking for. Consider the above example from Moss Bros. Perhaps this customer didn’t go through with their purchase of the suit jacket because they didn’t have pants to match; now, the offer for the entire three-piece suit is on the table, at a discounted price - which may be exactly what they were looking for before opening their wallet. On the other side of things, perhaps the individual realized the items they added to their cart were too pricey and, rather than taking the time to look for similar but cheaper items, they simply abandoned their purchase altogether. For both type of product (jewelry or lotion/cleanser), Nordstrom provides two options - each of which vary rather drastically in terms of price. While not fully personalized (i.e., the company might want to consider the customer’s purchase history and buying thresholds when presenting these offers), this email certainly provides options for individuals living on two different budgets. As we mentioned in the intro, there are a number of reasons why customers abandon their virtual shopping carts. While nailing down exactly why a specific customer abandoned their cart at the last minute might require some detective work (and some guesswork), doing so can allow you to address this issue in a way that not only mitigates the problem, but also shows your would-be customer that you truly care about them. While your ultimate goal is, of course, to recover the abandoned sale, you want to be sure that the reason your former cart abandoner came back is because you’ve provided them with the exact value they were looking for. Again, not only will this help you win back the initial sale, but will also likely lead to deeper engagement with the customer in question in the long run. 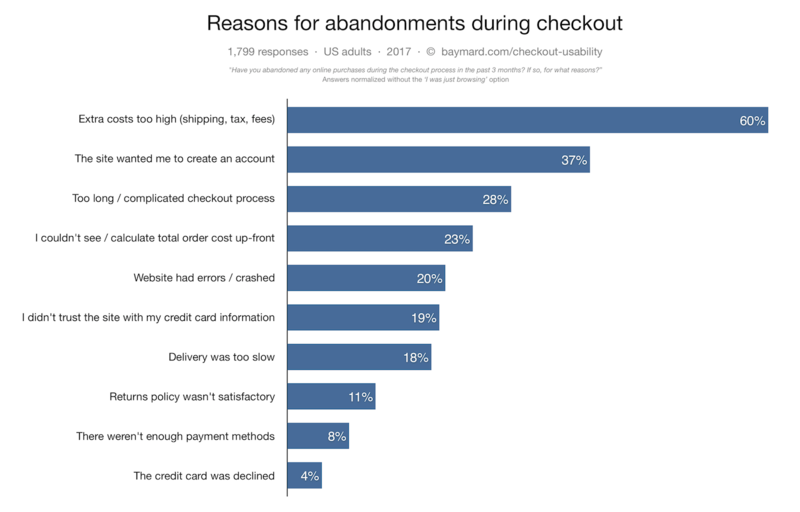 It is essential that you make it easy for cart abandoners to resume their shopping experience right where they left off. In other words, be absolutely certain that you provide a direct link to their shopping cart within the body of your email. 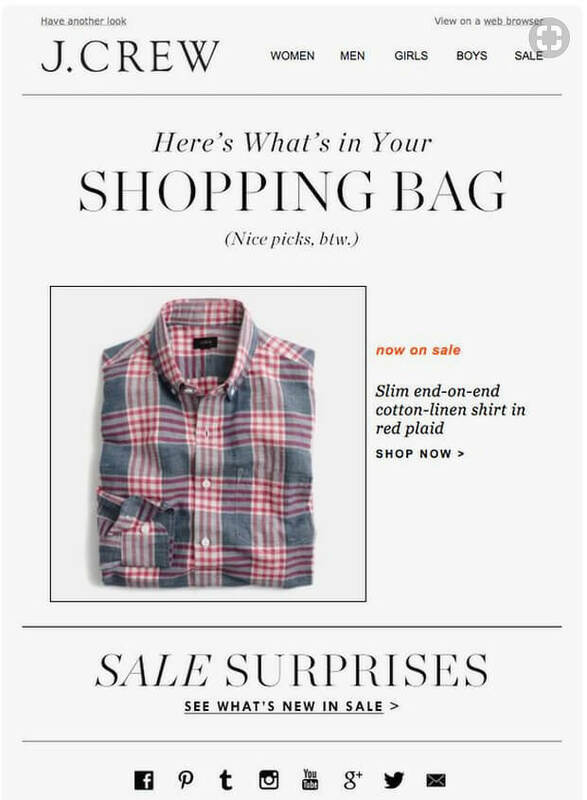 This email makes it a point to explain that every link within the email brings the customer back to their shopping cart - which is exactly where you want them to be. In this example, the CTAs are rather ambiguous: Does clicking on “Shop” bring you to the product page, or to your shopping cart with these items in them? Or will it simply re-add the individual product to a new shopping cart, leaving it up to you to find and re-add the other two items? Remember: there’s a pretty good chance your cart abandoners were either confused or otherwise put-off by something on your site in the first place. 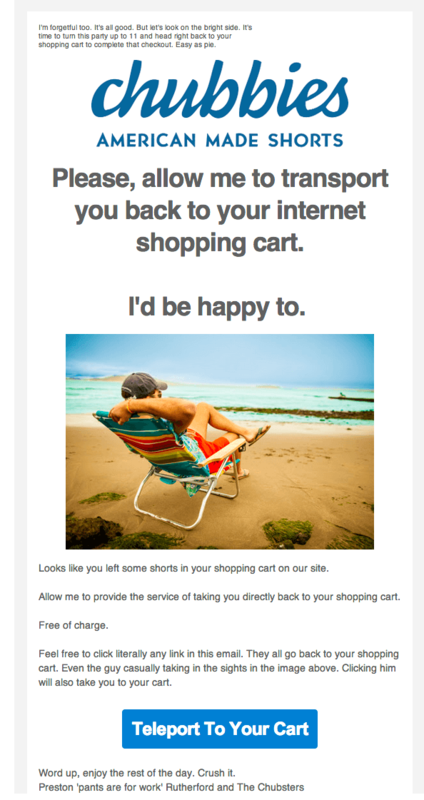 If your cart abandonment email only furthers this confusion, there’s almost no chance of you winning them back. Now, as we’ve alluded to before, you may be able to get away with including CTAs to other products (and to your site in general) within your abandonment emails. But you want to be careful when doing so. While the email includes a ton of other links - to different products, different sections of the website, and even to the company’s social media pages - after the fold, the main CTA is immediately visible right when the individual clicks on the email. 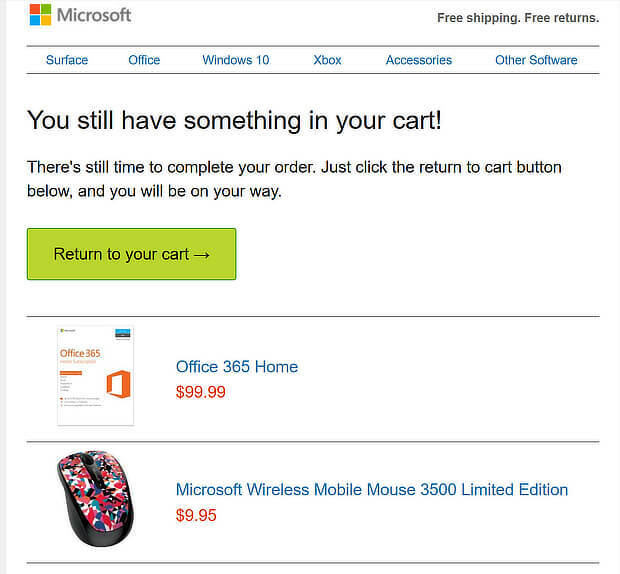 Again, the main goal of a cart abandonment email is to get the would-be customer to continue with their initial purchase; any additional purchases they make should be considered a bonus. That said, while it may be tempting to include offers of extra value within your cart abandonment emails, it’s more prudent - and likely more beneficial - to focus on one goal at a time. While timing is important for pretty much all things marketing, it’s absolutely imperative that you reach out to your cart abandoners while their initial shopping experience is still relatively fresh in their mind. Typically, you’ll have at most three chances to get these individuals back on track before they move on without making a purchase. 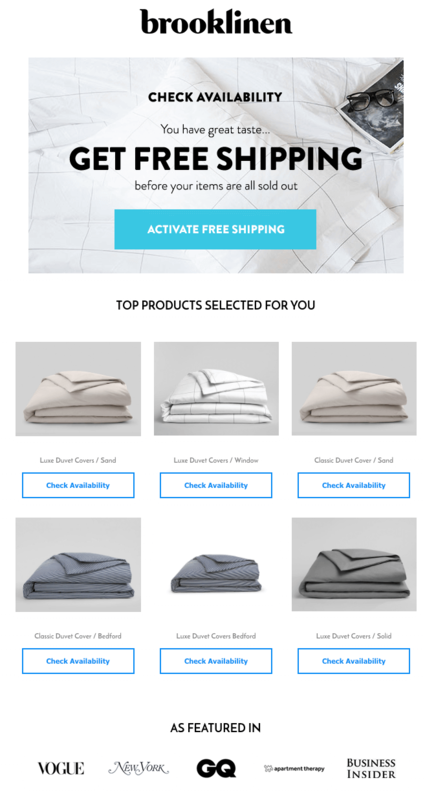 You’ll want to send the first email to your cart abandoners almost immediately - within, at most, a few hours of their leaving your site empty-handed. 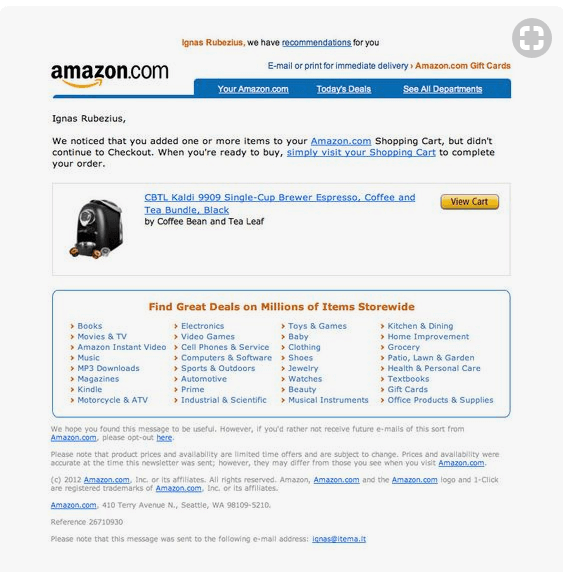 While the email does, of course, point the individual back to their shopping cart, sealing the deal is clearly secondary to figuring out how to enhance the individual’s experience, here. In cases in which it’s unclear why a would-be customer left your site before converting, this initial email can provide you with valuable insight as to how to move forward. In many cases, this will be your last chance to get your cart abandoners to convert. That being said, you want to be absolutely certain that you’ve provided as much value as you possibly can to them in the hopes of bringing them back on board. At any rate, if you do choose to send this third email, it should be after 24-48 hours have passed since your last interaction with the individual (whether initiated by them or your company). As this email will be your chance to win back the would-be customer (at least in terms of their initially-planned purchase), you’ll want to increase whatever incentive you’re providing accordingly. This might mean offering an even higher percentage off their purchase, or eliminating a free shipping threshold (i.e., providing free shipping immediately). SmartrMail has found that abandoned cart emails with discount offers of 10% and up and free shipping will recover most sales. However, because you’ve increased the incentive (and will, in turn, be making much less off of the purchase than you initially anticipated), you’ll definitely want to implement a time limit for the offer. If the individual does go through with the purchase, there’s a decent chance they’ll stick around a little longer, allowing you to hopefully recoup the revenues you lost in providing the huge incentive. If they don’t go through with the purchase - even after being provided such a massive discount - there’s little chance they would have stuck around, anyway. As we said in the intro, it’s actually more likely that a given visitor to your site will abandon their cart than it is that they’ll go through with their purchase as intended. Needless to say, that’s a whole lot of revenue left on the table. The good news, of course, is that developing email campaigns to re-engage these cart abandoners isn’t all that costly - and it can lead to major gains when implemented correctly. The most important thing to keep in mind is that all cart abandoners abandon their cart for a reason. If you can figure out what that reason is - and make the appropriate improvements - you may just gain a loyal customer for life. A former teacher, Matt now specializes in R&D for ecommerce business owners and helps guide merchants in understanding the importance of this digital-first world. We've Launched Our New Google Shopping Feed Tool Supporting URL and File Imports! Want to see The Ultimate Ecommerce Marketing Suite in action?